I've mentioned, repeatedly, that I'm a big fan of supporting local restaurants. I went to a chain Italian restaurant the other night and felt guilty the entire time. (But it wasn't my fault! I didn't want to deal with the craziness of The Feast and it was relatively late at night.) One of my favorite, blossoming local restaurants is Go Bistro, located in Mayfield Heights. 1. They take customer feedback seriously. Since they opened late last year, they've changed their menu offerings and kitchen service based on feedback received from actual diners. Sure, things were a little bumpy at first in the kitchen and with the wait staff, but management seems to have addressed those issues and made it possible to get a delicious meal - fast. 2. They're constantly trying new things. The management at Go Bistro has hired an e-mail marketing firm to help them announce their weekly, holiday, etc. specials. Do I necessarily care about rib specials? No. But I respect the fact that they're trying to attract a web savvy consumer base to their restaurant. 3. The food is delicious. (and the coffee is amazing! I need to ask them what they use) On my most recent trip I ordered a turkey Havarti sandwich with no turkey (obviously) and made it a combo and added a side salad. 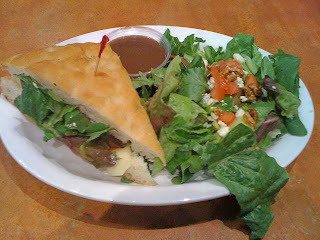 I love the sandwiches at Go Bistro because the bread is always ridiculously fresh. I've never smelled bread baking on the premises, so they must have a daily bread service that provides them with some of the best foccacia I've ever eaten. The one negative comment that I could make about Go Bistro is that there are limited vegetarian options, and to my knowledge, zero vegan options. They're more than happy to make accommodations, though, which is what I'd expect any decent restaurant to do. I'd love to see every restaurant offer a plethora of vegetarian entrees, but for now I'm happy to be able to eat a modified sandwich or a salad. If you happen to be in the Mayfield area and are looking for a fast and fresh lunch or light dinner, be sure to check out Go Bistro. In this economy, every dollar counts when it's spent at a local restaurant.